Campus of Auburn University, downtown Auburn, one of Auburn's many biking and walking trails, and Auburn City Hall. "The Loveliest Village On The Plains"
Location of Auburn in Lee County, Alabama. Historic Scott-Yarbrough House,"Pebble Hill" in Auburn, Alabama. Inhabited in antiquity by the Creek, the land on which Auburn sits was opened to settlement in 1832 with the Treaty of Cusseta. The first settlers arrived in the winter of 1836 from Harris County, Georgia. These settlers, led by Judge John J. Harper, intended to build a town that would be the religious and educational center for the area. Auburn was incorporated on February 2, 1839, in what was then Macon County, covering an area of 2 square miles (5.2 km2). By that time, Methodist and Baptist churches had been established, and a school had been built and had come into operation. In the mid-1840s, separate academies for boys and girls were established in addition to the primary school. This concentration of educational institutions led to a rapid influx of families from the planter class into Auburn in the 1840s and 1850s. By 1858, of the roughly 1,000 free residents of Auburn, some 500 were students. In 1856, the state legislature chartered a Methodist college, the East Alabama Male College in Auburn. This college, now Auburn University, opened its doors in 1859, offering a classical and liberal education. With the advent of the Civil War in 1861, Auburn quickly emptied. All of the schools closed, and most businesses shuttered. Auburn was the site of a hospital for Texan Confederate soldiers, but only saw direct combat with the raids of Rousseau in 1864 and Wilson in 1865. After the Civil War, Auburn's economy entered a prolonged depression that would last the remainder of the century. Public schools did not reopen until the mid-1870s, and most businesses remained closed. A series of fires in the 1860s and 1870s gutted the downtown area. East Alabama Male College was turned over to the state in 1872, and with funds from the federal Morrill Act was renamed Alabama Agricultural and Mechanical College with a new mission as a land grant college. Passage of the Hatch Act in 1887 allowed for expansion of agricultural research facilities on campus. In 1892, the college became the first four-year college in Alabama to admit women. This, combined with increased interest in scientific agriculture and engineering and new funding from business licenses, allowed the city to start expanding again. By 1910, Auburn's population had returned to its antebellum level. SIAA Conference championships won by the Auburn college's football team brought attention and support to Auburn, and helped fill the city's coffers. Fortunes were quickly reversed with the collapse of cotton prices in the early 1920s and the subsequent Great Depression a decade later. Due to these events, the state government became unable to fund the college, and—as Auburn's economy was completely derived from the college—residents were forced into a barter economy to support themselves. Money began to flow into Auburn again with America's entry into World War II. Auburn's campus was turned into a training ground for technical specialists in the armed forces. After the war, Auburn was flooded by soldiers returning to school on the G.I. Bill. Primarily due to this influx of students, Auburn began a period of growth that lasted through the 1950s and 1960s. A considerable amount of residential and business construction pushed Auburn's growth outside of the original boundaries of the city, leading to a series of large annexations which expanded Auburn to nearly 24 square miles (62 km2). Construction of Interstate 85 beginning in 1957 connected Auburn to the major cities of the state. This allowed for Auburn University (renamed in 1960) to schedule more home football games in Auburn rather than in larger cities, creating a strong tourism component in Auburn's economy. Auburn Mall opened as "Village Mall" in 1973. Growth slowed somewhat in the 1970s, and a series of budget cuts made it clear that Auburn's sole economic reliance on Auburn University put the city in a tenuous position. Backlash against what was seen as an ineffectual city council led to the election of Jan Dempsey as mayor in 1980 and the removal of the previous city government system in favor of a council-manager system. With a new government in place, the city began aggressively pursuing industry, leading to a nearly 1,200% increase in the number of industrial jobs over the next twenty years. As public satisfaction with the city administration reached record levels, Auburn began very rapid residential growth. A series of reports in the 1980s and 1990s ranking the Auburn public school system among the top in the state and nation convinced thousands of new residents to move to Auburn over the past 25 years. Between 1980 and 2003, Auburn's population grew by 65%, and Auburn's economy expanded by 220%. With growth came issues of urban sprawl, which has become the primary political issue in Auburn at the turn of the 21st century. A creek flowing through Chewacla State Park in Auburn. The city of Auburn lies in western Lee County and is bordered by the city of Opelika to the northeast and by Chambers County to the north. The city stretches south to the Macon County line in the southwest. Auburn sits on the Fall Line at the juncture of the piedmont plateau and the coastal plain. Portions of Auburn also include the southernmost exposure of rocks indicating the Appalachian orogeny—as such, the last foothill of the Appalachian Mountains lies in Chewacla State Park in southern Auburn. As a result of these three varied physical environments, Auburn has an extremely diverse geology. The southwest and west regions of the city on the plateau are marked by rolling plains and savannahs, with the undeveloped portion primarily being used for cattle grazing and ranching. South of this region sits the coastal plain, with sandy soil and pine forest. Parts of north Auburn have much more rugged topographies, with thick forests in high hills and deep hollows of the type common to parts of eastern Tennessee. The region surrounded by Chewacla Park in the south of the city contains sharp peaks and sudden drops of elevation as the 1.05 billion-year-old rock of the Appalachians meets the coastal plain. Auburn sits near the divide between the Chattahoochee and Tallapoosa River watersheds. Auburn is drained by three main creek systems: in the south, by the Chewacla/Opintlocco Creek system; in the north, by the Saugahatchee Creek system; and in the extreme northern reaches of Auburn by Sandy Creek. The dividing line between the Chewacla and Saugahatchee watersheds roughly follows railroad line east–west through the center of town. Auburn is located at 32°35′52″N 85°28′51″W﻿ / ﻿32.59778°N 85.48083°W﻿ / 32.59778; -85.48083 (32.597684, −85.480823) and according to the U.S. Census Bureau in 2000, the city has a total area of 39.6 square miles (103 km2), of which, 39.1 square miles (101 km2) of it is land and 0.4 square miles (1.0 km2) of it (1.11%) is water. The elevation of Auburn at City Hall is 709 ft (216 m) above sea level; though due to Auburn's diverse topography, elevation ranges from 386 ft (118 m) above sea level where Chewacla Creek crosses Sand Hill Road to 845 ft (258 m) above sea level in northern Auburn near the Chambers County line. Typical of the Deep South, Auburn has a humid subtropical climate (Köppen Cfa), marked by mild winters, early springs, long, hot, muggy summers, and warm autumns. Due to its position near the Gulf of Mexico, the city receives a significant amount of rainfall—on average, 52.6 inches (1,340 mm) per year—though there is a distinct dry season in the late summer and early fall. Severe storm activity - thunderstorms producing damaging winds and/or large hail - is common from the late winter through early summer. There is the risk of tornadoes. Owing to its proximity to the Gulf, Auburn is also subject to fringe effects from tropical storms and hurricanes in the summer and fall. Hurricanes Opal in 1995 and Ivan in 2004 are among two of the most notable tropical systems to affect the Auburn area in recent memory, bringing torrential rains and high winds. Winters are typically mild, with an average 0.7 inches (1.8 cm) of snowfall, though more than three-fourths of all seasons do not have any measurable snow. Most days have 50 °F (10 °C)+ highs, and from December to February, an average total of 10–11 days of 70 °F (21 °C)+ highs, while it rarely stays below freezing all day. However, the city straddles the border between USDA Plant Hardiness Zones 7B and 8A, and there are an average of 5.6 nights with sub-20 °F (−7 °C) lows. On the other end, summers are long, hot, and humid, with 57 days of 90 °F (32 °C)+ highs. Although the actual air temperature reaching 100 °F (38 °C) is uncommon (1.2 days annually), high humidity can push daytime heat indices over that mark. The record high for Auburn is 103 °F (39 °C), set on July 15, 1980 (needs updating), and August 10, 1980, while the record low was −7 °F (−22 °C), set on February 13, 1899, and January 21, 1985. As of the 2010 census, there were 53,380 people, 22,111 households, and 9,939 families residing in the city. The population density was 919.3 people per square mile (58.07mi2). There were 20,043 housing units at an average density of 512.2 per square mile (197.8/km2). The racial makeup of the city was 75.1% White, 16.5% Black or African American, 0.3% Native American, 5.3% Asian, 0.00% Pacific Islander, 1.10% from other races, and 1.6% from two or more races. 2.9% of the population were Hispanic or Latino of any race. There were 22,111 households out of which 22.1% had children under the age of 18 living with them, 32.4% were married couples living together, 8.8% had a female householder with no husband present, and 55.2% were non-families. 33.8% of all households were made up of individuals and 11.5% had someone living alone who was 65 years of age or older. The average household size was 2.24 and the average family size was 2.99. In the city, the population was spread out with 17.5% under the age of 18, 38.0% from 18 to 24, 23.1% from 25 to 44, 14.6% from 45 to 64, and 6.9% who were 65 years of age or older. The median age was 23.3 years. For every 100 females, there were 100.3 males. For every 100 females age 18 and over, there were 102.4 males. The median income for a household in the city was $35,857, and the median income for a family was $72,771. Males had a median income of $51,644 versus $36,898 for females. The per capita income for the city was $24,656. About 9.2% of families and 25.2% of the population were below the poverty line, including 15.0% of those under age 18 and 3.6% of those age 65 or over. The reason for this enormous inequality between households and families is due to the large number of students living in the area. Auburn has a council-manager government led by an eight-member city council, a mayor, and an appointed city manager. The city council acts as a legislative body of the city, passing laws and regulations and appointing citizens to the city's various boards, including the Auburn City Board of Education. Each member of the city council is elected for a four-year term from one of eight geographic wards. Ward 1 is designed to ensure African-American representation on the council. Ward 2 - Ron Anders, Jr. The mayor of Auburn is elected in the city at-large to a four-year term. The duties of the mayor are, per State Code: 1) ceremonial, 2) to serve as the Governor's contact in the event of an emergency and 3) to conduct Council meetings. The Mayor has no administrative duties, as the City Manager serves as the CEO. As such, the position of mayor in Auburn is primarily symbolic. The current mayor of Auburn is Ron Anders, elected in 2018. The day-to-day operations of Auburn are run by the City Manager. The City Manager is appointed by and serves at the leisure of the City Council. The City Manager is responsible for the appointment and dismissal of all department heads, advises the council on policy matters, and creates and administers the city budget. The current City Manager of Auburn is James C. Buston, III. The United States Postal Service operates a post office at 300 Opelika Road, Auburn, Alabama. Samford Hall, on the Auburn University campus. Auburn's economy is centered on Auburn University and providing university-affiliated services. Auburn University employs 4,300 people, which is roughly one-quarter of the city's total workforce. In addition, 2,400 Auburnites are employed by the federal and state government in positions which are generally connected with the university. Some 8,500 are employed in service sector jobs. Auburn's industrial base is built around mid-sized, high tech manufacturing and research firms. Auburn has one industrial park and four technology parks where main areas of industrial focus are on the manufacture of small engines, automotive wheels, fuel cells, plastic injection technology, and vehicle armor. The 156-acre (0.63 km2) Auburn Research Park opened in September 2008 and will be anchored by a firm which specializes in research in high-resolution, dark field optical microscopy. The Research Park includes several buildings housing research in many different specialties, including the MRI Research Center which features both a 3 Tesla and a 7 Tesla MRI scanner. Overall, the manufacturing sector accounts for some 5,000 jobs in Auburn. Auburn is located between the Kia and Hyundai automobile manufacturing facilities with the Kia Motors manufacturing plant about 35 miles (56 km) east on I-85 and the Hyundai Motors manufacturing plant about 55 miles (89 km) west on I-85/I-65. The Public Safety Department has five divisions: Police, Fire, Communications, Codes Enforcement, and Administration. The department provides all law enforcement, public safety services, and emergency 911 response and dispatch services for the City of Auburn and the campus of Auburn University. Construction activities in the City are monitored and inspected by the Codes Enforcement Division. Ambulance services are provided via a contract with East Alabama Medical Center. Auburn's police department has been criticized for having a quota: officers must make at least 100 interactions with the public a month - either fines, arrests, or interviews. Critics say this encourages police officers to make arbitrary or unfounded arrests. See also Auburn City Schools, Auburn High School (Alabama) and Auburn University. Auburn, as a college town, is largely driven by the influence of education. Auburn has one post-secondary school, Auburn University, which has an enrollment of just over 27,000. Auburn University is a land-grant university and a sea and space grant university with traditionally strong programs in business, engineering, agriculture, and veterinary medicine. The university is largely focused on undergraduate education, with a graduate program of 5,000. Auburn University is a research institution, with primary areas of research focus including wireless engineering, molecular biosciences, transportation, aquaculture, and forest sustainability. Auburn is also home to several research centers, including the Ludwig von Mises Institute. Auburn's public school system includes eight elementary schools, two middle schools, one junior high school, and one high school. Auburn's school system has repeatedly been ranked among the top public school systems in the state and nation. Auburn City Schools has been ranked among the top 100 school districts in the United States by Parenting magazine and as the best educational value in the Southeast by the Wall Street Journal. Auburn's Early Education Center has specialized programs for autism education, has been recognized as a national Blue Ribbon school, and is an Intel and Scholastic School of Distinction. Wrights Mill Road Elementary School was recognized as a national Blue Ribbon school in 2009, while Auburn Junior High School is recognized nationally for its 21st Century Laptop Learning Initiative, which places laptops in the hands of students in grades 8 and 9. Auburn High School has strong International Baccalaureate, widely offered Advanced Placement, and renowned music programs, and was ranked in 2006 by Newsweek as the top non-magnet public high school in Alabama, and one of the top 30 in the United States. Auburn has the Auburn Public Library. Auburn public school system will almost be done implementing phase one of Auburn City School Facilities Comp Plan 2024. The New Auburn High School, New Auburn High School will be 350,000 square-foot and cost $72 million and house 10th-12th grade with a capacity of 2,200 students. The old Auburn High School site will be converted into the Junior High School that'll serve 8th and 9th grade students. While the Old Junior High School will be converted into East Samford School, a 7th grade academy. Leaving Drake Middle School middle school to only host 6th grade. Toomer's Corner in downtown Auburn. 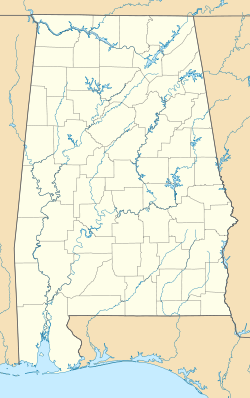 Auburn is located in the southeastern part of Alabama and is accessible by Interstate 85, US 29, and US 280. The city also has a general aviation airport, the Auburn University Regional Airport (AUO) (formerly Auburn-Opelika Robert G. Pitts Airport), which is 2 miles (3.2 km) east of downtown Auburn. The major commercial airports closest to Auburn are the Hartsfield–Jackson Atlanta International Airport (ATL) (Atlanta) and the Birmingham–Shuttlesworth International Airport (BHM) (Birmingham). Each of these airports is within 2 hours driving distance from Auburn and together they offer air service to most of the world's major airports. There are also two regional airports close to Auburn: Montgomery Regional Airport (MGM) (Montgomery) and the Columbus Metropolitan Airport (CSG) (Columbus). There is daily ground transportation between Auburn and the Atlanta airport. Tiger Taxi, Eagle Town Taxi, Spirit Town Taxi all provide both local taxi service and flat-rate transportation service to other cities. Auburn University provides the Tiger Transit bus system, which runs near the campus and to area apartment complexes part of the year. Lee-Russell Public Transit (LRPT) offers Dial-A-Ride services in Lee and Russell counties. Hail-a-ride apps available: Gata Hub. There are few sidewalks and no city bus system in Auburn. It is a heavily car dependent community. It has received an award for being a bike friendly town from the League of American Bicyclists. The Auburn Bike Committee posts a list of bike rides and events. Auburn is the home to the Jule Collins Smith Museum of Fine Art. The Smith Museum maintains a collection of primarily 19th- and 20th-century American and European art. The museum's exhibits include the Advancing American Art Collection, consisting of 36 works by mid-20th-century American artists including Jacob Lawrence, Ben Shahn, and Georgia O'Keeffe, a collection of engravings by naturalist John James Audubon, and works by Dalí, Chagall, Renoir, Picasso, and Matisse. Major sculptural works at the museum include a collection of Tibetan bronzes, Jean Woodham's Spinoff, and Dale Chihuly's Amber Luster Chandelier. Also in Auburn is the Telfair Peet Theatre, which performs a series of plays and musicals each year. The Auburn Community Orchestra, as well as the bands of Auburn University and the Auburn High School Honors Band perform dozens of yearly concerts, including a series of outdoor concerts in the fall at Kiesel Park. Other musical series in Auburn include that of the Auburn Knights Orchestra, a big band jazz orchestra, and the Sundilla Acoustic Concert Series. The theatre is rumoured to be haunted by a ghost named Sydney, who the theatre department appeases before every performance with a package of Reese's Pieces. Auburn is also home to Auburn Area Community Theater (AACT), a community-based organization that puts on three productions a year, including a spring children's show. All performances are rehearsed and performed at the Jan Dempsey Community Arts Center. There are a number of dance schools in the city that give classes in a variety of dance styles, such as ballet, jazz, hip-hop, ballroom, and even Irish dancing, which is supported by the Drake School of Irish Dance. Recreational opportunities in Auburn include 16 parks, highlighted by Chewacla State Park, a 700-acre (2.8 km2) park in the Appalachian foothills, Kiesel Park, a 200-acre (0.81 km2) "passive" park with numerous trails, and the Louise Kreher Forest Ecology Preserve. The Donald E. Davis Arboretum showcases 150 different tree species native to Alabama and the Southeast. Auburn is also ringed by miles of multi-use trails and several lakes. Auburn has no professional sports teams, but nonetheless has a vibrant sports culture due to the presence of Auburn University's NCAA Division I athletic squads. Auburn University football in particular is a major force in Auburn's culture and economy. When Auburn University has home football games in the fall, the city often sees over 100,000 visitors, and the yearly economic impact is measured at nearly $100 million. While other sports do not attract as many tourists to Auburn, the university's 17 varsity sports offer citizens a variety of other opportunities for viewing competition at virtually the highest level. Home football games particularly change the face of Auburn for several weekends a year. Tens of thousands of fans flood the campus hours—sometimes days—before the game to tailgate, creating a festival-like atmosphere throughout the weekend. Football games in Auburn are played in 87,451 seat Jordan–Hare Stadium, which sits on the main campus, just a few blocks from downtown. Basketball is played at 9,600-seat Auburn Arena, while baseball games are held at 4,096-seat Plainsman Park, which was named the top collegiate ballpark in the nation by Baseball America in 2003. One of Auburn's most competitive sports is the swimming program, which has won seven of the last nine NCAA national championships including the last five straight and 11 consecutive SEC men's championships. Also, the women's program have won five NCAA national titles and four SEC championships. The teams compete at the James E. Martin Aquatics Center. More Olympic swimmers have come from Auburn's swimming program than any other university swimming program. The Auburn Metro Area is home to 146 holes of golf at six courses, and has played host to several professional and amateur golf tournaments. Auburn Links was rated as one of the top three new courses in the nation when it opened in 1996, and the Robert Trent Jones-designed Grand National course in the Auburn metro is often cited as one of the top public courses in the nation. Because of this, in 2005, the Auburn Metro Area was ranked number 1 in the United States for golf by Golf Digest. Auburn is served by the Columbus, Georgia Television Designated Market Area (DMA). Some Montgomery, Alabama stations are carried on cable systems and WSFA is designated by the FCC as a significantly viewed station for the area. Charter Communications and W.O.W. (Wide Open West) provide cable television service. DirecTV and Dish Network provide direct broadcast satellite television including both local and national channels. The On-Campus television station, Eagle Eye TV, is broadcast twenty-four hours a day for residents living on-campus and the immediate surrounding areas. Radio stations WEGL and WAUD are licensed to Auburn and broadcast from the city. Radio station WKKR is licensed to Auburn and broadcasts from nearby Opelika. Newspapers serving the city include The Opelika-Auburn News, The Auburn Villager, and The Auburn Plainsman. 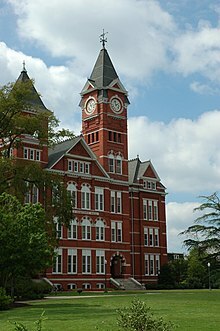 Auburn has had many notable citizens in its 170-year history, including Nobel Prize winners such as Frederick C. Robbins and George F. Smoot, world-class architects including Paul Rudolph and Samuel "Sambo" Mockbee, artists, governors, generals and admirals, and professional athletes. Robert Gibbs, the 28th White House Press Secretary and the first Press Secretary for President Barack Obama, is a graduate of Auburn High School. ^ a b "QuickFacts Auburn city, Alabama". 2016 Population Estimate. U.S. Census Bureau, Population Division. May 28, 2017. Retrieved May 28, 2017. ^ "Census: Huntsville and Auburn growing rapidly, Montgomery shrinking". AL.com. Retrieved April 9, 2018. ^ "Piedmont Upland Physiographic Section". Encyclopediaofalabama.org. October 3, 2013. Retrieved July 14, 2014. ^ a b c d e f "Station Name: AL AUBURN AGRONOMY FARM". National Oceanic and Atmospheric Administration. Retrieved March 8, 2013. ^ The Arbor Day Foundation. "The Arbor Day Foundation". Arborday.org. Retrieved July 14, 2014. ^ "Monthly Averages for Auburn, AL". The Weather Channel. Retrieved March 8, 2013. ^ "Annual Estimates of the Resident Population: April 1, 2010 to July 1, 2014". Archived from the original on May 24, 2015. Retrieved May 21, 2015. ^ "Auburn, AL Population - Census 2010 and 2000 Interactive Map, Demographics, Statistics, Quick Facts - CensusViewer". censusviewer.com. Retrieved 2019-03-18. ^ "U.S. Census Bureau QuickFacts: Auburn city, Alabama; Lee County, Alabama; Opelika city, Alabama". www.census.gov. Retrieved 2019-03-18. ^ "City Council Members". City of Auburn. Archived from the original on November 3, 2011. Retrieved August 24, 2015. ^ Editor, Allison Blankenship | Associate. "Ron Anders wins Auburn mayoral race". The Auburn Villager. Retrieved 2019-03-18. ^ "Home". Auburn Research & Technology Foundation. ^ "A Police Officer Gets Fired For Exactly The Wrong Reason". Upworthy. Retrieved September 19, 2013. ^ "City of Auburn - Page Not Found". auburnalabama.org. Archived from the original on July 25, 2009. Retrieved March 21, 2015. ^ "Significantly Viewed List" (PDF). Federal Communications Commission (FCC). Archived from the original (PDF) on May 23, 2014. Retrieved December 19, 2014. ^ "Opelika-Auburn News". Opelika-Auburn News. ^ "The Auburn Villager". The Auburn Villager. ^ "The Auburn Plainsman". The Auburn Plainsman. ^ "George F. Smoot - Biographical". Nobelprize.org. Retrieved July 14, 2014. Atkins, Leah Rawls (1992). Blossoms Amid the Deep Verdure. Retrieved June 8, 2005. Auburn-Opelika Metropolitan Planning Organization/Lee Russell Council of Governments (2004). Auburn-Opelika 2030 Long Range Transportation Plan, Draft Final Report. Atlanta, Ga., Day Wilburn Associates, Inc.
City of Auburn (1998). Auburn 2020. Retrieved June 8, 2005. City of Auburn. City Council. Retrieved June 8, 2005. City of Auburn, Economic Development Department (2005) City of Auburn Community Profile 2005. Retrieved June 10, 2005. City of Auburn, Office of the City Manager (2000). Growth Boundary Plan for the City of Auburn. Pamphlet. Auburn, Ala.
Auburn University Athletic Department (2004). 2004 Auburn Football Media Guide. Retrieved June 10, 2005. Flynt, Wayne (2001). "The Great Depression and the South". Lecture given April 2, 2001, Auburn, Ala.
Frazer, Mary B. Reese (1920). Early History of Auburn. Manuscript. Preserved on microfilm through the USAIN/NEH State and Local Literature Preservation Project, (1997) Mobile, Ala., Document Technology, Inc.
Hausman, Tamar. School Expenses. The Wall Street Journal, Southeast Journal. (May 13, 1998). The Jule Collins Smith Museum of Fine Art at Auburn University (2004). JCSMFA Permanent Collection. Retrieved June 10, 2005. Newsweek. The Complete List of the Top 1000 High Schools. Retrieved June 10, 2005. Schafer, Elizabeth D. (2003). Auburn: Plainsmen, Tigers, and War Eagles.Charleston, SC: Arcadia. Schafer, Elizabeth D. (2004). Auburn Football. Charleston, SC: Arcadia. United States Geological Survey (1971). Auburn Quadrangle Alabama-Lee Co. 7.5 Minute Series (Topographic). Retrieved June 8, 2005. United States Geological Survey (1971). Opelika West Quadrangle Alabama-Lee Co. 7.5 Minute Series (Topographic). Retrieved June 8, 2005. Watson, Douglas J. (1997). Workable Government: Auburn Provides Solutions for Community Challenges. Auburn, Ala., Craftmaster Printers. The Weather Channel (2005). Daily Averages for Auburn, AL (36830). Retrieved June 9, 2005. Wikimedia Commons has media related to Auburn, Alabama. Wikivoyage has a travel guide for Auburn, Alabama.